Killer unissued blues rocker! This great collector item comes in a ultra cool picture sleeve! Was Pat Hare clairvoyant? The savage guitarist sang of killing his woman on this highly intimidating blues and did just that in 1963, along with a Minneapolis cop who came to investigate the shooting. Hare spent the rest of his existence in prison. Born with the curious handle of Auburn Hare in Cherry Valley, Arkansas on December 20, 1930, Hare and his family moved onto a farm near Parkin, Arkansas when he was 10 (his grandmother nicknamed him Pat). 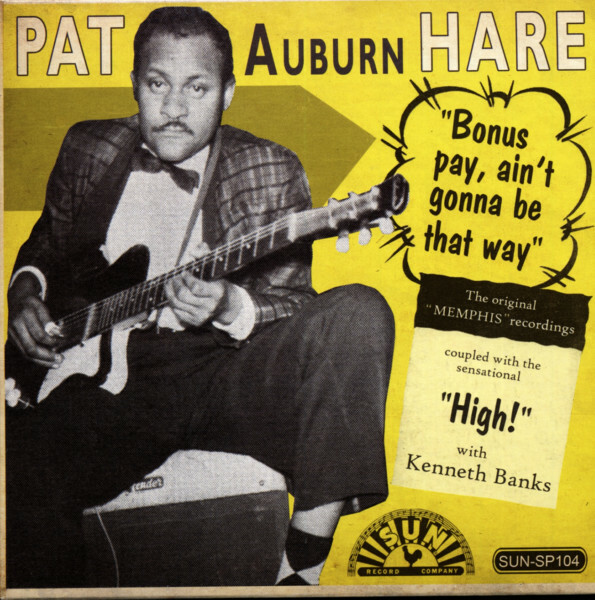 Hare learned his early guitar licks from Joe Willie Wilkins and by the late '40s was gigging with Howlin' Wolf, broadcasting over KWEM with him in 1951. 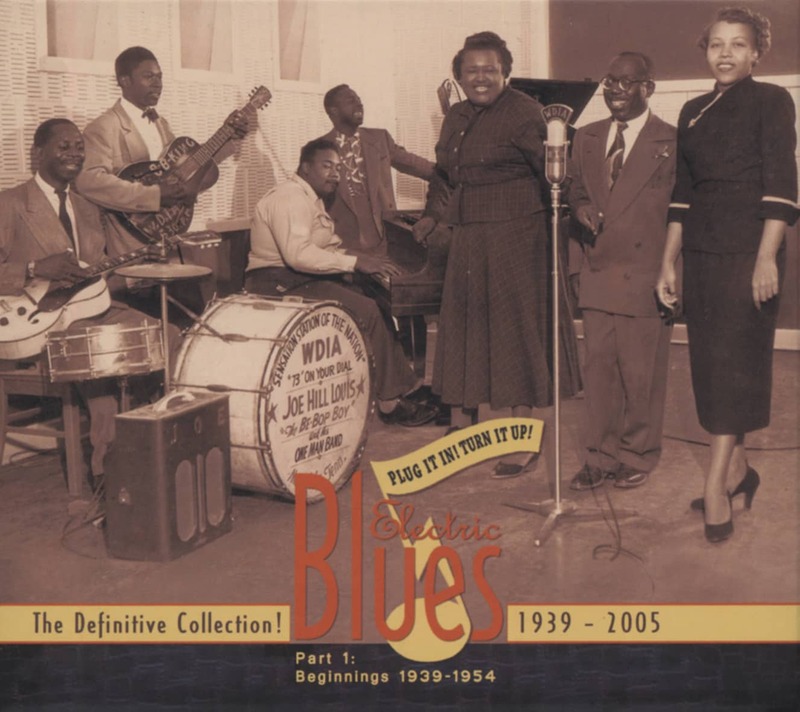 He started making himself known in Memphis, first recording as a sideman with his cousin Walter Bradford for Sun before joining Little Junior Parker's Blue Flames. Hare backed Junior in the Sun studio, as well as Big Walter Horton, Coy 'Hot Shot' Love, Rosco Gordon, Kenneth Banks, Big Memphis Ma Rainey, and James Cotton, utilizing a crunching, ultra-distorted guitar tone that sounded capable of shearing clean through steel. Pat only got one chance to spotlight his vocal cords at Sun, and he made the most out of it with Billy 'Red' Love on the 88s and drummer Israel Franklin. I'm Gonna Murder My Baby was a remake of Doctor Clayton's 1941 Bluebird platter Cheating And Lying Blues, but the good doctor didn't have the advantage of Hare's vicious, jagged fretwork. 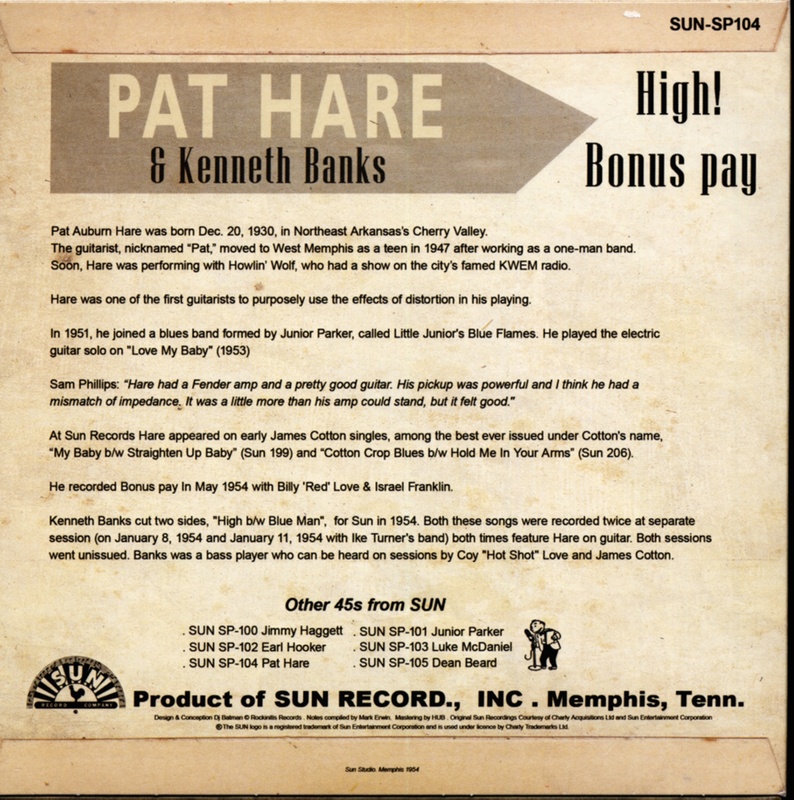 Hare also cut a version of Eddie 'Cleanhead' Vinson's Bonus Pay that day, both titles bafflingly consigned to the Sun vaults. Hare went on to play on Bobby 'Blue' Bland's '57 smash Farther Up the Road before Cotton offered him a gig with Muddy Waters' band. Pat was prominent on Waters' '58 houserocker Walking Thru The Park, his Big Bill Broonzy tribute LP, and his boisterous live album from the 1960 Newport Jazz Festival. Lured north to Minneapolis by a promise of musical work from harpist Mojo Buford and guitarist Jojo Williams, Hare relocated. Cursed with a violent temper when he was drinking (which was often), Hare shot his considerably older girlfriend on December 15, 1963, then blew away the first cop to break through the front door with another flurry of lead. The cop's partner fired back, seriously wounding Hare. He was sentenced to life in prison but sometimes was allowed to play guitar while in stir. He formed a band called Sounds Incarcerated and later even occasionally left the prison grounds to perform until lung cancer killed him on September 26, 1980. This song stands as a spookily prescient epitaph. Customer evaluation for "Bonus Pay b-w High 7inch, 45rpm"